I'm giddy with excitement to share these with you. I'm a huge fan of the Spring collections...if I had to pick one season that I look forward to the most it would be Spring. 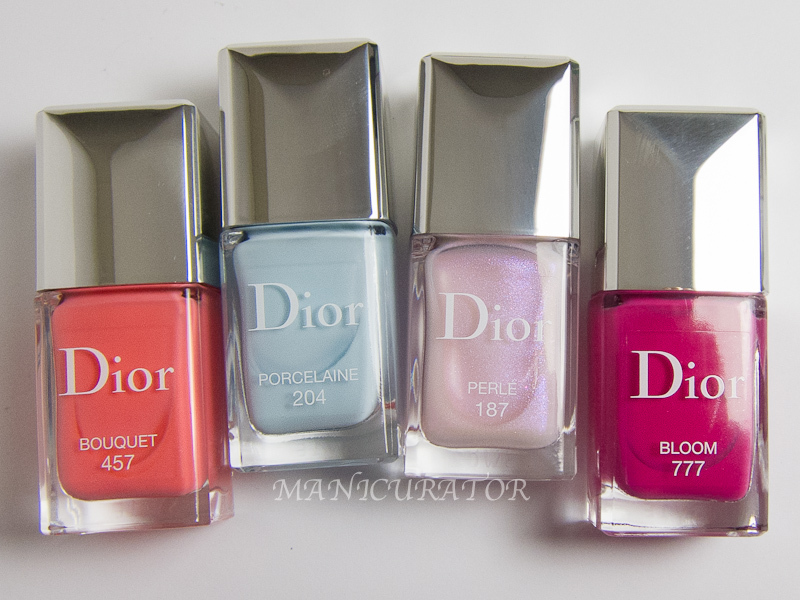 Dior Trianon Spring 2014 is one of my favorite collections to date. Those are bold words, I know! But this collection is just..aaah! After the gold infused Holiday collection inspired by the opulence of Versailles, this Spring Dior takes it's feminine inspiration from the private chateau (Petit Trianon) of Marie-Antionette. 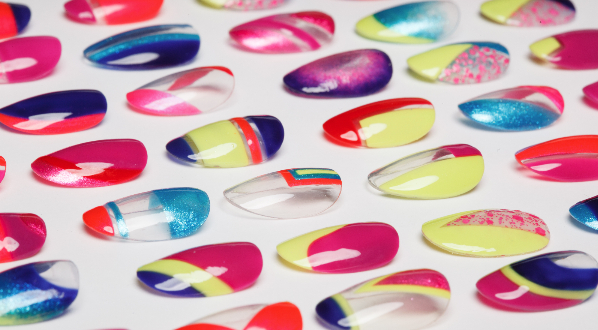 It includes 4 main shades one of which is an incredible frosted matte top coat, and 2 more exclusive shades. More details in this picture heavy post! 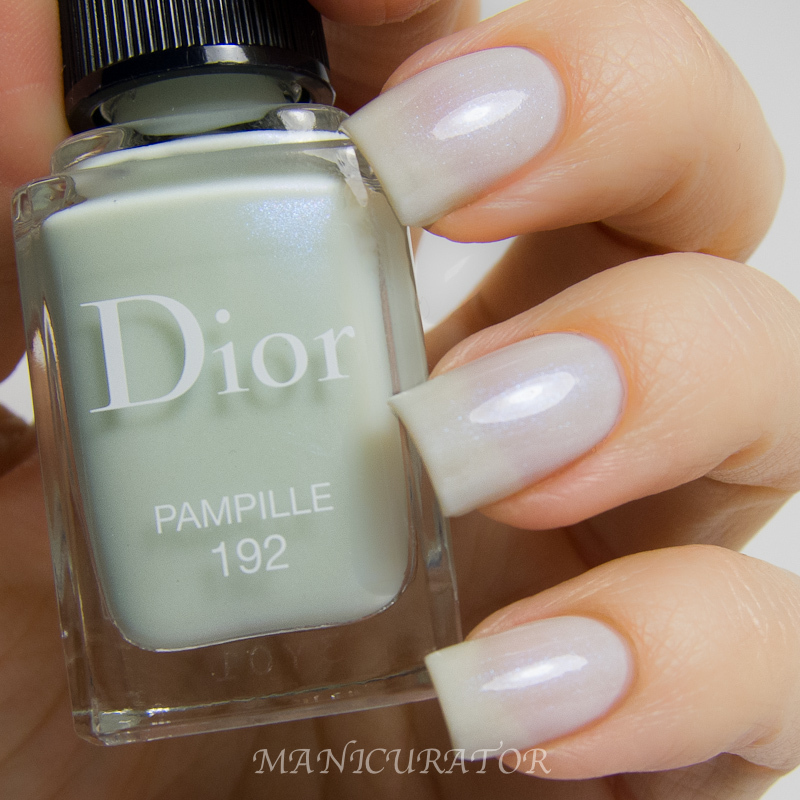 First off, I was most curious to try out Dior Pampille 192. It's deceiving because it looks minty in the bottle but on the nail has a white base with gorgeous shimmer. I have two coats on. Perfect formula, easy application. Here's a look at 3 coats. As you can see, still leaves a bit of visible nail line. Not something I mind, and such a unique shade in my opinion! 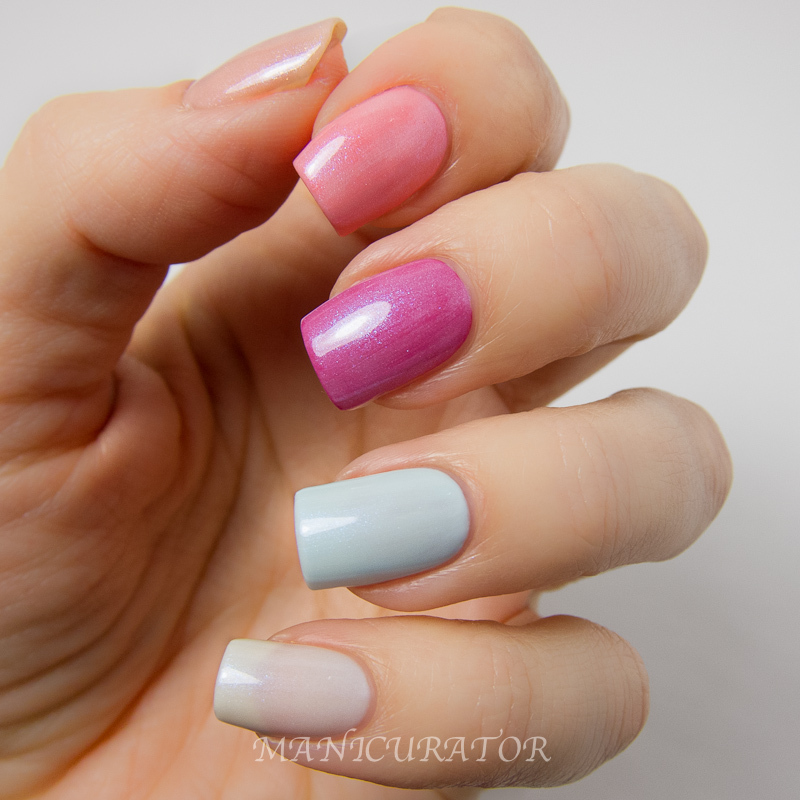 A look at all the shades swatched except Perle (the top coat). All 2 coats over Diorlisse Ridge Filler, no top coat, and all perfect formulas. The above and below photos showing each color topped with one coat of Pampille. I was curious to see how it would layer. It's not designed to be a top coat and over darker colors you can see brush strokes. I ADORE it over Porcelaine. In fact it reminds me of one of my all time lemmings Chanel Riva. Again, from thumb to pinky: Blossom, Bouquet, Bloom, Porcelaine, Pampille. Two coats for all, no top coat. And finally, the star of this collection! 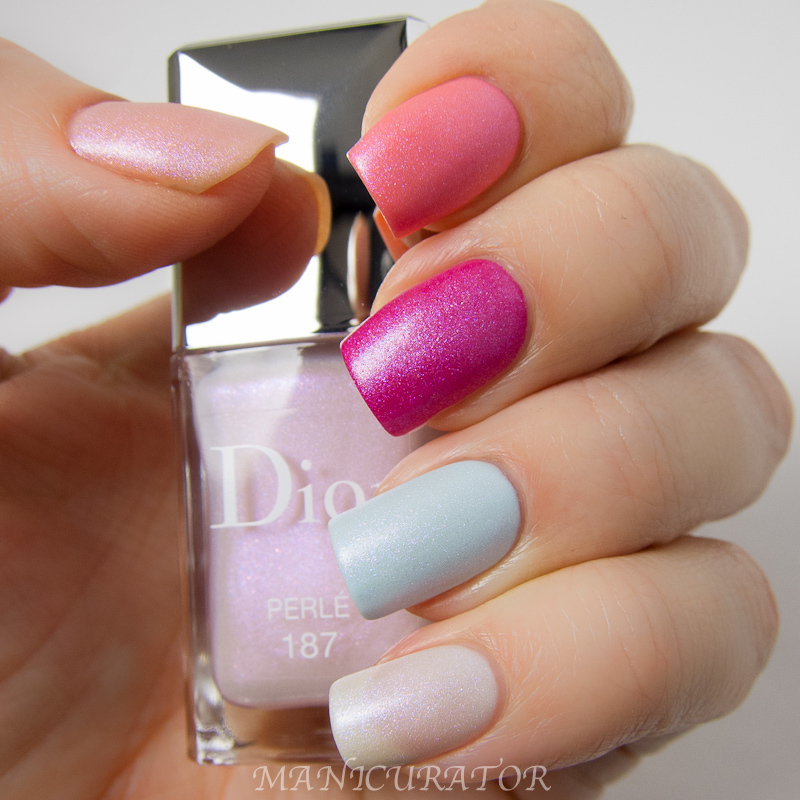 Dior Perle (from Dior's description): frosted effect transforming top coat mattifies upon application to reveal a mauve shade with an unexpected pearly-frosty effect for candy-like nails. Showing one coat of Perle, which applies effortlessly over (from thumb to pinky) Blossom, Bouquet, Bloom, Porcelaine, and Pampille. I am in love with Perle. It looks amazing over all of them! 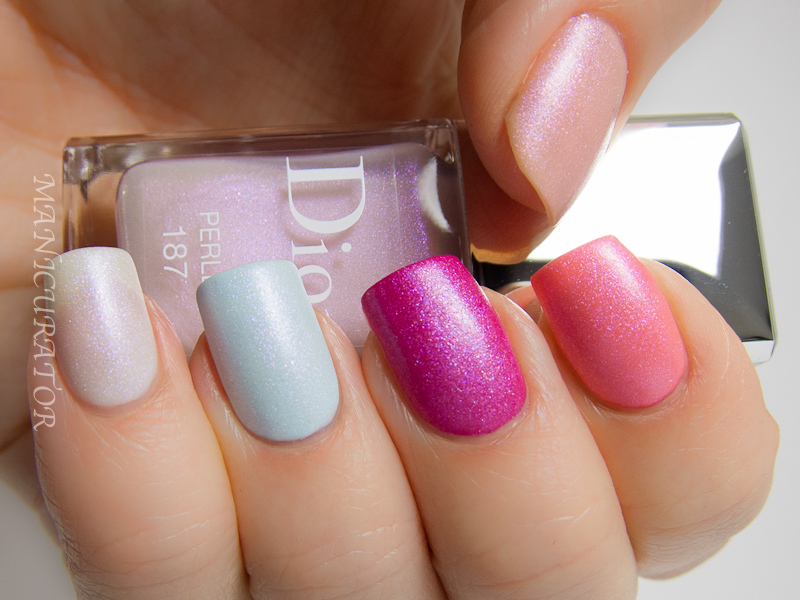 The following three photos shows the whole thing top coated with Dior Top Coat. Again, looks amazing. I'd have a hard time trying to pick a favorite among this group, but Perle over Porcelaine is dreamy and over Blossom and Bloom my next choices. These are available now, but I imagine they will sell out quickly. Have you picked up any yet? Which is your favorite? These are stunning! Such pretty shades for Spring. Great swatches, Victoria. Oooh, these are so pretty! I love the look of Bouquet and Bloom! 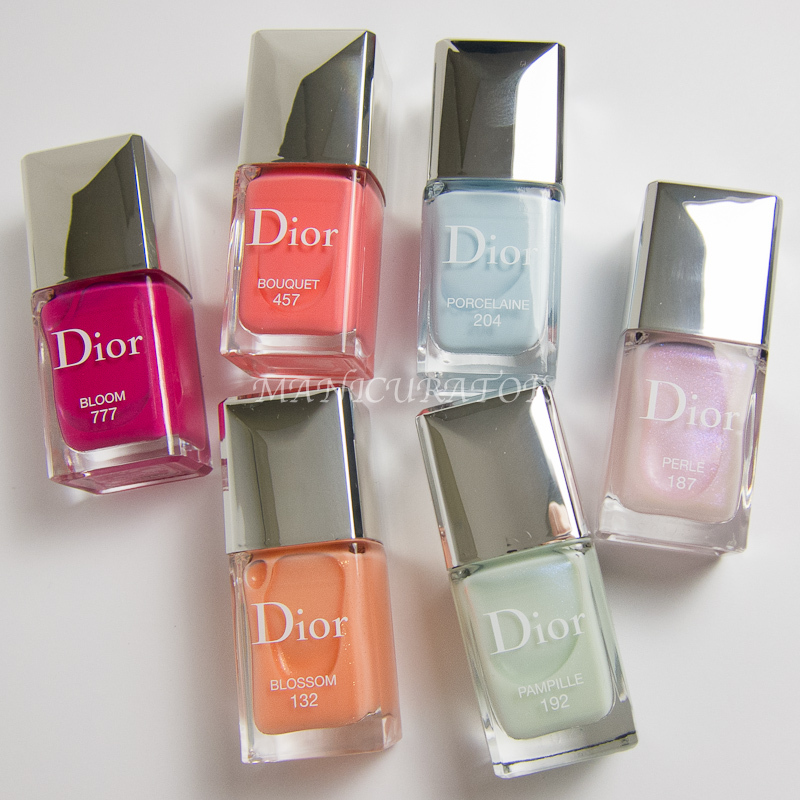 I wish I could afford Dior. I want Pampille so badly! 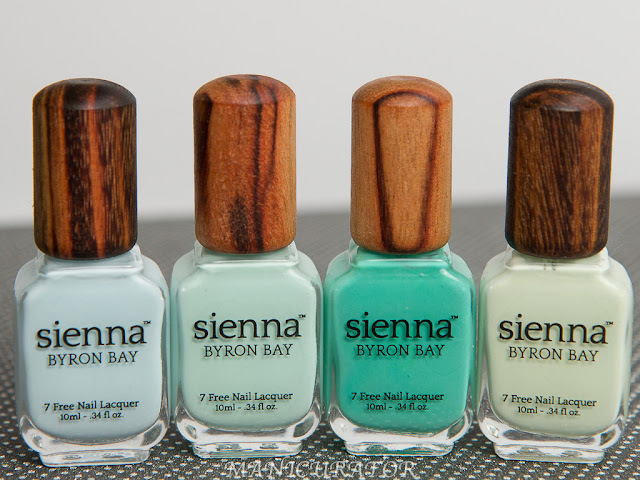 These are such pretty shades and will be perfect for spring! Crackers!!! I want so many of these colors!!! I already have Pampille and Perle on my wish list.. :) those are gorgeous. 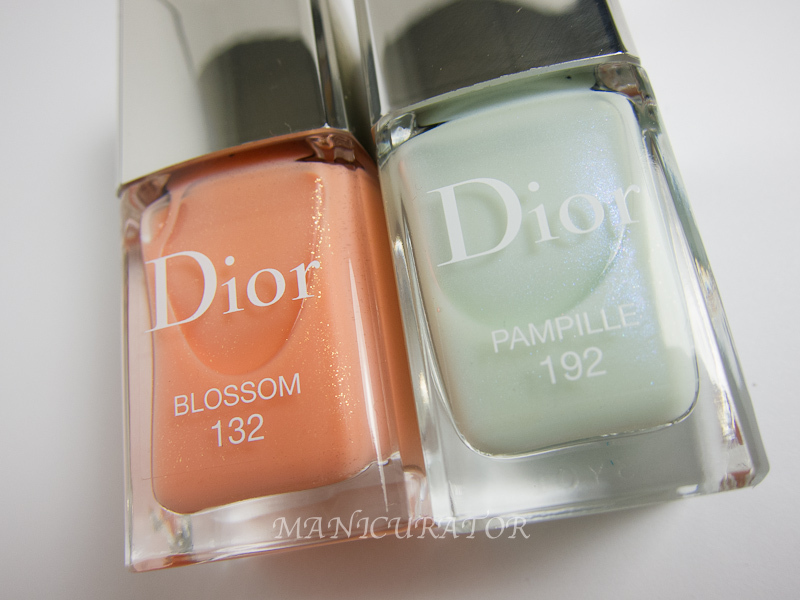 The other shades I don't care so much about, and Blossom I find plain ugly. Gorgeous swatches, but I can't help but feel they look better in the bottle. That mint is disappointingly sheer and the rest all look best with Perle over top. Oh well, they're still nice but at least I don't have to try and justify the price tag, haha! 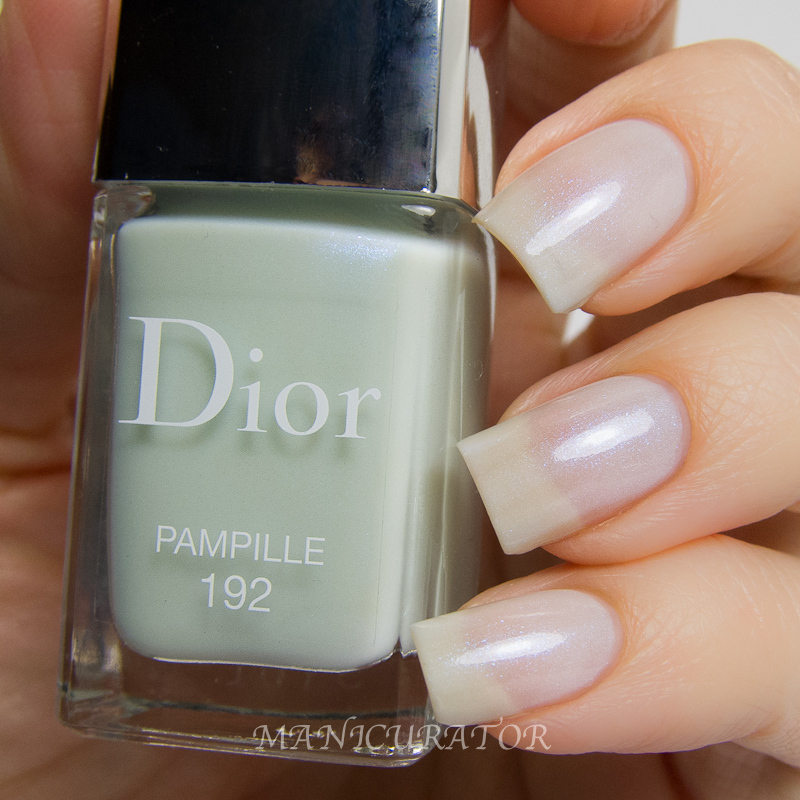 I hope to get my hands on Porcelaine but Perle over Bouquet is STUNNING! Wow, super stunning! I absolutely LOVE you swatches! I am in love with these polishes! I have Porcelaine and I loooove it!